Styling ideas, encouragement and easy-care tips for keeping houseplants to boost health and happiness. Walk into a home filled with happy houseplants, and you’re bound to feel instantly more relaxed. Living plants boost oxygen, clean the air and enhance any room they’re in with fresh, organic style. Of course, if you think you are not blessed with a green thumb, then keeping houseplants alive, let alone happy, can seem next to impossible. Read on for styling ideas, encouragement and easy-care tips for keeping houseplants to boost health and happiness. Houseplants fill otherwise dead space with vibrant energy. In the practice of feng shui, plants are considered one of the most effective cures for areas in the home that need help. Boost any unused or awkwardly shaped space with a potted or hanging plant, and you’re sure to notice an immediate change. Always choose houseplants that are suited to the light levels in your space — ask staff at a local nursery if you are unsure what to pick. Houseplants bring the kitchen to life. The kitchen makes a wonderful home for plants, from delicate vines twining down a shelf to a pot of culinary herbs ready to snip while cooking. Especially in an apartment where you cannot change the wall color or appliances, bringing in fresh plants is an easy and budget-friendly way to personalize your space. Growing tip: Keep houseplants in clusters. If you’ve had trouble keeping houseplants alive and healthy in the past, you might want to try keeping them in a group this time around. Not only will it be easier to remember to water them when they are conveniently located in one spot, but a group of plants also creates its own microclimate, which boosts humidity and helps prevent water loss. Airy, open bookshelves like the ones shown here can make a stylish plant stand with plenty of room for a host of specimens. Don’t tuck potted plants into a bookcase with a back and sides, as the poor plants will not receive enough light. Why not dine in a jungle? Create a lush ambience in your dining room by filling the space with plants. For the most jungle-like effect, set a few large potted plants on the floor, place a cluster of smaller potted plants on a windowsill or credenza, and hang a pot or two from the ceiling. Project idea: Planted centerpiece. Tired of changing floral arrangements? Buy yourself some extra time and give the air in your home an oxygen boost at the same time with a living centerpiece instead. Wheatgrass, cat grass and herbs are good choices for the table, though just about any small potted plant will work. Be sure to use containers with saucers beneath them to protect your table from drips, and save the taller plants for elsewhere — just as with flowers, you want to be able to see the person sitting across from you. Revive the conservatory of flowers. If you are lucky enough to have a sunroom (or any space with skylights and ample windows), consider it your solemn duty to fill it with as many beautiful living plants as you wish. Unlike most rooms in the house, in the sunroom you don’t need to stick with plants that require indirect light — so you can try your hand at something tropical, like a bird-of-paradise. Sleep soundly with greenery around. Refresh the air in the bedroom with a potted plant or two for a more peaceful sleep and a healthier atmosphere. If your bedroom doesn’t get too much light, put your houseplant in the sunniest possible spot, and elevate it on a stool or plant stand to maximize the light that falls on its leaves. Growing tip: Finicky plants love the bath. The humidity created by steam from the shower and bath makes the bathroom a haven for fussy houseplants, like maidenhair ferns. And since the bath is all hard surfaces, having a few living plants around is a wonderful way to soften the space. Give macramé a chance. Popular in the 1970s and experiencing something of a revival, macramé has a new, brightly colored look and a modern boho vibe. Try hanging just one plant or suspend a cluster for a lush, jungle-like feel. Ferns and other plants with a tendency to drape do especially well in hanging planters. Start small. Even a single air plant on a bedside table can bring a welcome dose of optimism when it’s the first thing you see each morning. So if you’re not sure where to begin, start with one little plant, well tended and loved. Don’t be afraid to go big. Whatever ails your space, a great big houseplant can go a long way toward fixing it. A large potted plant (or small tree) can bring more personality to your home, make a small space feel bigger or fill a big, open room without costing a fortune. Live, learn and let it go. The fact is, we all kill plants — some more often than others. 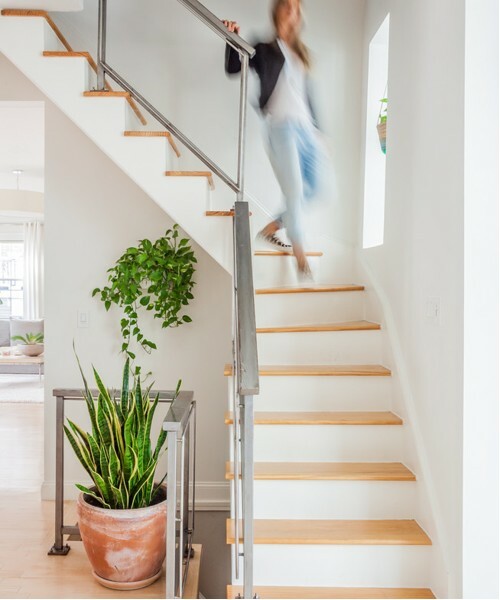 Just because you’ve had bad luck in the past shouldn’t mean you must deny yourself the pleasure of enjoying living green plants in your home forever. Give it another go! Forgive yourself and move on. For the best chance of success in the future, shop for healthy plants from a reputable nursery, enlist the help of a knowledgable staffer to choose the right plants for your space, and embrace technology (set a reminder on your phone) to remind you when to water.